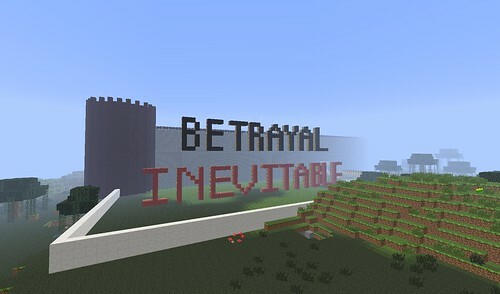 In our tour of This Land, the Inevitable Betrayal section of the Minecraft server, we talked with the girls who created the village and castle about their process. This led me to think about how we could recognize the skills that kids practice and develop in virtual worlds and games. I posted my thoughts on my blog: Electrons and Ink. I'd love to hear your thoughts! You might want to check out this article: It Looks Like Fun, But are they Learning? Innovation: New tinkering strategies that emerge through growing understanding of tools, materials, and phenomena. Solidarity: Sharing, supporting, and pursuing shared purposes with other learners in the Tinkering Studio, or with the artifacts they have left behind. I especially think Intentionality and Innovation are important qualities of learning. Yes, Minecraft is one big tinkering studio, letting users play, experiment, and create! I like the connection there. In the case of the Inevitable Betrayal village/castle, I think the girls' engagement and intentionality were evident from the product they created. As they talked about their work, there were hints of innovation and solidarity. From those four qualities, yes, learning is going on. I feel some desire to define what they are learning, though. I mean, if their tour and discussion of the IB village and castle demonstrated learning, what kind of badge could we award to show outsiders what they had accomplished? I think educators who observe students work/play in Minecraft definitely observe valuable learning, but not everyone gets to do those observations. Can we honor and demonstrate what kids are learning in some concrete way like a badge? Is there a value to that? Should we? Final note: I just stumbled on the Massively @ Jokaydia's list of Awards. This is akin to what I was envisioning.